Pembroke Pines may not be well known to those living outside of South Florida, but the city's profile was raised considerably in the tennis world Sunday, when two of its 16-year-old residents--Stefan Kozlov and Sonya Kenin--hoisted the winners' trophies at the Metropolia Orange Bowl. 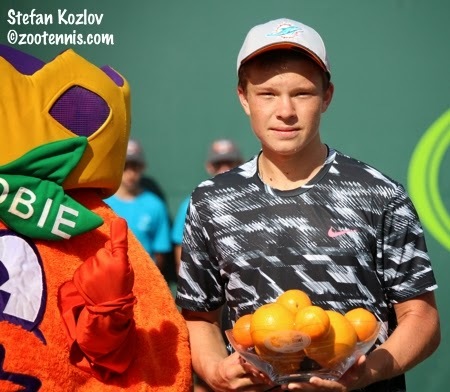 For Kozlov, who was a finalist last year in the 18s, and runnerup in the Junior Orange Bowl 12s in 2009 and the 14s in 2011, the feeling after defeating unseeded Stefanos Tsitsipas of Greece 2-6, 6-3, 6-2 was more relief than elation. "Losing in the final three times, losing in two slam finals this year, I'm just really relieved, to be honest," Kozlov said. "I'm relieved I finally won this, and hopefully I don't have to come back here next year." Kozlov looked to be heading for yet another Orange Bowl final disappointment when Tsitsipas, broken to start the match, won four straight games, breaking Kozlov twice and closing out the set with another break. Tsitsipas, who had impressed fans all week with his powerful forehand and one-handed backhand, was happy to accept the errors Kozlov was giving him, while taking control of points and keeping Kozlov on the defensive. "He has really legit weapons," Kozlov said. "I wasn't expecting that. He didn't give me rhythm, he was serving good and his forehand is amazing." But after a shirt change and bathroom break, Kozlov began to take control of points in the second set. He broke Tsitsipas to start the set, and began to employ his drop shot effectively, as Tsitsipas was positioned several feet behind the baseline. The crowd of 400 or 500 was solidly in Kozlov's corner, and several fans were providing loud appreciation and encouragement, with "Sugar" and "We Believe" their most frequent contributions. Up 3-2 and serving in the second set, Kozlov got into the act, giving himself a pep talk, saying, "This is all me. Let's go, focus every point. Don't let up." He added a "vamos" and an "allez", held serve, then broke Tsitsipas again. Although Kozlov wasn't able to serve out the set, he had found his game. The errors were gone, the pace and placement of his shots improved and the drop shot continued to baffle Tsitsipas, who lost the set on a Kozlov drop shot winner. After a bathroom break for Tsitsipas, the third set began with two holds, but Kozlov was broken on a double fault to give Tsitsipas a 2-1 lead. He was unable to sustain the advantage, however, and the unforced errors, absent in the first set, began to pile up as he began to tire. Kozlov broke and held for a 3-2 lead, and when he broke again, motioning the crowd to get behind him after a forehand winner gave him break point, his lead seemed safe. Kozlov held at love in the next game, hitting a deft backhand drop shot winner to take a 5-2 lead, and put an end to all the past Orange Bowl regrets in the next game, fittingly, with a forehand drop shot winner. After his three-set loss last year, in much warmer conditions, Kozlov had vowed his fitness would never again be an issue, and in the late stages of Sunday's final, there were no signs he was winded or tiring. "Last year's match with Francis (Tiafoe) was much more physical than this one, to be honest. A lot of the points were long and Francis gets to every ball. But I think my fitness has improved. My match with William (Blumberg) and Reilly (Opelka) and this match, I'm feeling really confident toward the end, and believe that I can do whatever it takes to win." Tsitsipas, who defeated World No. 1 Andrey Rublev of Russia in the semifinals, was dismayed by his performance in the final two sets, but said, "I beat some good players out there. I hope next year I'll do better, and go again to the final." Tsitsipas, who trains on five clay courts at a club in Athens, said he would like to play the Australian Open juniors next month, but because there is little monetary support from the Greek federation, he may not. "The money's the main thing in tennis," he said. "If you have money, you can travel, can do anything. Our federation is not very rich. They are trying to improve and I think it will get better in the next years." Kozlov's plans for January include the two new hard court Futures in Southern California and the Maui Challenger. Kenin is also looking to compete in more professional level events in 2015 after she defeated qualifier Ingrid Neel 6-3, 6-3 to claim her first Grade A title. Kenin, who has said all week that the Orange Bowl feels like home to her, really began to pick up the level of her game after struggling in the second round. She dominated in wins over Eddie Herr finalist Gabby Ruse of Romania in the quarterfinals and CiCi Bellis in the semifinals, pointing to a peanut butter sandwich as the reason she had found her stride. "I started eating finally, listening to the trainer," said Kenin, who cramped in the second set of her 6-4, 6-7(3), 6-0 second round win over Mayuka Aikawa of Japan. "So now I'm always eating a peanut butter sandwich." Against Neel, who was playing her ninth match in nine days, Kenin was the steadier of the two, especially on her serve. "I saw she was nervous, so I just kept putting the ball deep," said Kenin, who is coached by her father Alex. "I wasn't playing my best game at the beginning especially, but somehow I got in a groove and played good." Neel had all kinds of trouble serving in the first set, hitting nine double faults, including three in the final game of the first set. But she did not put the blame on nerves or fatigue. "I've done that a couple of times before," said Neel, a 16-year-old from Minnesota who has trained full time at the IMG Academy for more than two years. "It just gets off, sometimes just goes south and it's hard to bring it back up. It was disappointing. It was a lot of free points and you can't really do that, especially in a final, especially against Sonya." Kenin went up 4-0 in the second set, but Neel began to cut down on her errors and closed the gap to 4-2. Kenin reestablished herself with a love hold for a 5-2, lead but Neel made her close it out. Down 30-40, at 5-3 Kenin came up with one her best serves of the match, and after Neel missed a backhand volley, Kenin had a match point. Again she got a first serve in, and after a short rally, Neel missed wide to give Kenin the win. "I never expected this to happen," said Kenin, who is unsure whether she will play the Australian Open juniors or stay in Florida for the $25,000 tournaments in January. "I never expected to beat CiCi yesterday, I was expecting a three-set match. It was good that I pulled it through." Bellis, who earned the No. 1 ITF World Junior ranking for 2014 with her quarterfinal win, added the Orange Bowl doubles title to her stellar year, teaming with Marketa Vondrousova of the Czech Republic for a 7-5, 2-6, 10-4 victory over No. 7 seeds Miriam Kolodziejova of the Czech Republic and Tereza Mihalikova of Slovakia. The first set was extremely close, with five of the first ten games going to deciding points, but the top seeds broke Mihalikova for 6-5 and Vondrousova served out the set. The second set was all Kolodziejova and Mihalikova, although again deciding points played a huge part, but Bellis and Vondrousova took control of the match tiebreaker, going up 7-1 and closing it out. "We didn't play our best, I think," said Bellis, who will begin training with the USTA in 2015. "But in the French (junior doubles) we lost in the tiebreaker in the finals, so I think we were both thinking about that a lot. So when we got to the tiebreaker, we started playing a lot better and that was good." 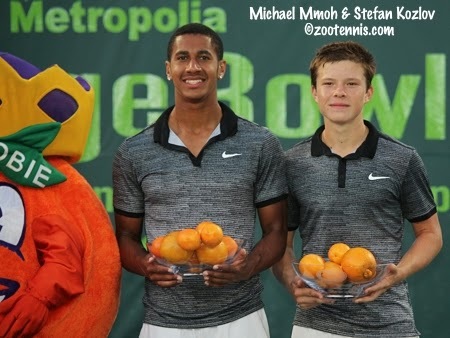 Kozlov won his second title of the day in the doubles, with Michael Mmoh, beating No. 2 seeds Seong Chan Hong and Yunseong Chung of Korea 6-4, 7-6(5). The top seeds looked to be cruising to a routine win with Kozlov serving at 5-2 in the second set, but Hong and Chung saved two match points from 40-30 in that game, and two more with Mmoh serving at 40-30 at 5-4. Hong was broken on a deciding point to make it 6-5, but Kozlov didn't even get to a match point this time, double faulting to send it into a tiebreaker. Mmoh and Kozlov went down 5-2 in the tiebreaker, as dusk began to descend on the Veltri Tennis Center, but Chung lost both his service points and energized, Mmoh and Kozlov took the next three, with Kozlov bouncing the putaway into the park landscaping on the last point of the 2014 junior tennis year. "We played really well to get to that position, but once we got to serve it out, those guys come up with some good shots and we didn't play our best tennis," Kozlov said. "It was a tough moment to be in," Mmoh said of the service games they couldn't close out. "It was a tense moment, but I always thought we were the much better team, so I wasn't extremely worried. And then everything came through in those last few points. It was a great way to end his junior career especially." For complete draws, see the tournament website.